ACIDOMIX® is a uniquely formulated blend of organic acids - formic, lactic and fumaric - and ammonium formate, encapsulated to ensure delivery of its acidification to the lower digestive tract. In addition to its preserving effects, ACIDOMIX is a strong antimicrobial that effectively reduces bacterial contamination levels and energy waste resulting in optimal growth rates. Producers are faced with a variety of challenges each day. Gut health does not have to be one of them. The simple addition of organic acids to the animal diet can optimize healthy gut flora by reducing bacterial contamination levels, producing multiple producer and animal benefits. ACIDOMIX® AFG is a proprietary blend of Gut Environmental Modifiers (GEMs) designed to improve feed quality and optimize efficient nutrient uptake resulting in improved nutritional performance. 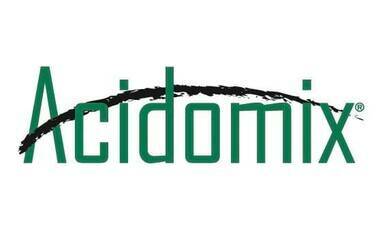 ACIDOMIX AFG also aids in suppressing bacterial and mold growth in feeds. ACIDOMIX® FG is a micro-granulated feed acidifier based on formic acid (E-236), lactic acid (E-270), fumaric acid (E-297) and ammonium formate (E-295). ACIDOMIX® FL is a liquid blend of GEMs designed to improve feed quality and optimize efficient nutrient uptake resulting in improved nutritional performance. This product effectively and efficiently sanitizes feed and drinking water by suppressing bacterial and mold growth.